Who would have thought that the relationship between Magneto and Professor Charles Xavier would be one of the key themes being traced in an X-Men movie? According to filmmaker Bryan Singer, who is directing X-Men: Days of Future Past, the upcoming mutant sequel will once again delve into the complex relationship between the X-Men's mentor and their greatest villain. 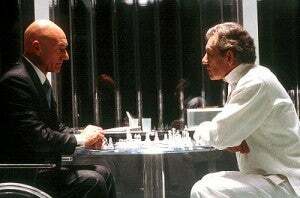 "Because I have both Ian McKellen and Michael Fassbender in the picture, you'll deal with both sides of that point of view and it really explores the relationship between Xavier and Magneto and the evolution of that relationship, where it came from and where it's going," Singer told Digital Spy during a video interview (embedded below). As far as tone, Singer acknowledged that he's got his own style when it comes to the X-Men films, and that while this movie takes place on a much larger canvas, with time travel and a massive cast, fans will likely recognize some of his trademarks.